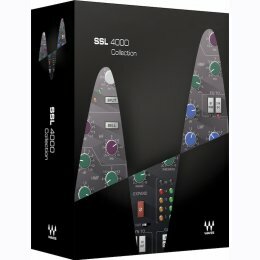 Developed under license from Solid State Logic, The SSL 4000 Collection includes four meticulously modeled plug-ins based on the legendary SSL 4000 Series: the SSL E-Channel, the SSL G-Master Buss Compressor, the SSL G-Equalizer and the all-new G-Channel. These plug-ins sound so close to the original consoles, even experts who work with SSL boards day in and day out can’t tell the difference. April 2018: NKS-Ready support has been added for Native Instruments' Komplete Kontrol and Maschine. This four-band equalizer, modeled on the SSL G Series EQ292, offers greater gain change than the E-Series EQ, and a slightly different curve. The SSL G-Equalizer includes a pre-boost dip and a pre-cut rise, as well as a broader Q for more extreme equalization. That’s why many leading engineers use the E-Channel’s equalization for detailed problem-solving and mixing, and the G-Equalizer to shape and give character to the sound. Based on the renowned master buss center compressor of the SSL 4000 G console, the Waves SSL G-Master Buss Compressor captures the unique sound of the original’s IC input and twin VCA gain-reduction amplifier design. The SSL E-Channel delivers the incomparable sound of the Solid State Logic 4000-series console’s all-discrete design and its Class A, VCA chip. It’s a slice of the world’s greatest hitmaking machine, in your computer. G-Channel consolidates the equalization and dynamic controls of SSL G Series consoles into one convenient tool. The G-Channel EQ module delivers the original hardware’s characteristic pre-boost dip, pre-cut rise, and broad Q for extreme frequency manipulation. The Dynamics section features soft-knee compression and limiting, a gate/expander, and automatic makeup gain for rock steady output levels. Together, they deliver the one-of-a-kind sound and convenient routing flexibility that have made the SSL G-Series console a control room classic.